Is woodworking your passion or you do it for professional reasons, in that case you must be aware about the relevance of the best hybrid table saw. As the market is flooded with the countless options for the table saws, but you need to rely only on the best information to get the best hybrid table saw. For this, you can go through the hybrid table saw reviews that would offer you an in depth analysis of the leading hybrid table saws that are available in the market. Moreover, you can also take a look at the different aspects of hybrid table saws that would enrich you with the vast information about the best hybrid table saws. Let’s have a view at the reviews of six bestselling hybrid table saw that not only provide the excellent productivity but also offer incredible results with high end precision and accuracy. 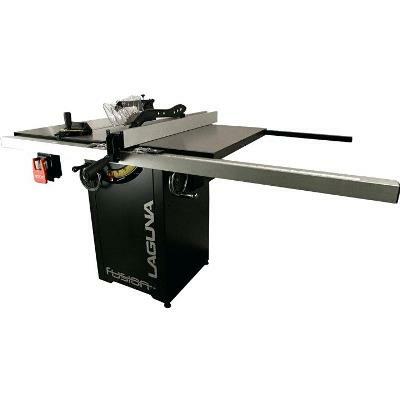 The Laguna hybrid table saw is a premium quality machine that is designed to cater to the requirements of the serious woodworkers and contractors. It comes with the advanced cutting features and offers the professional expertise in all the woodworking projects. It offers a great amount of tabletop space that makes it an ideal choice for the big projects. This hybrid table saw offers the fence storage capability, along with inbuilt wheels to ensure that the user gets the ample opportunities to use the table saw with precision. There is provision of riving knife and push stick to ensure the safety of the users. The Laguna hybrid table saw is a powerful machine that intends to provide the advanced features that ensure the precise outcomes in all the woodworking projects. The key point that I specifically like about the Laguna hybrid table is its clean and sophisticated designing that comes from the advanced engineering. The dimensions of the tabletop is 20″ x 27″ with table height of 34 ½ inches. But its prominent feature is the provision of trunnions that is not fixed to the table top, but it is mounted efficiently onto the frame. This feature makes it appear like a cabinet table saw and the table top also remains flat with amazing accuracy. Moreover, the Laguna hybrid table offers the interesting mix of advanced features that incorporate fence storage, inbuilt wheels along with riving knife. There is also the provision of a precision fence along with hairline readout that offers the safety to the users. The other key factor that I really like about this table saw is its provision of push stick. In fact, the push stick plays a crucial role in providing the safety measures to the users. Moreover, the Laguna table saw has got the added benefit as its push stick is mounted on the rip fence that only provides convenience, but also makes it certain to have the best safety feature for the users. Another aspect of this hybrid table saw that excites me is its effective precision in creating woodworking projects and that too at the competitive pricing. Not very effective for working on a large piece of wood. The table saw insert doesn’t have any support for rearing that makes it bog down under the pressure from the wood that is being inserted to the saw. It is slightly smaller in size. Bosch table saw is a power packed machine that comes equipped with innovative design along with advanced cutting features to offer excellent results. The 8 inch treaded pneumatic wheels add to the portability of the table saw. There is a feature of Square lock rip fence that helps in having the accurate cuts. The table top is designed with machined aluminum that offers premium quality finish and the provision of durability as well. It’s rip capacity which can be extended to cut the wood pieces with 40-inch width as well. I have used Bosch table saw in many of the professional woodworking projects and found it truly reliable and performance oriented. 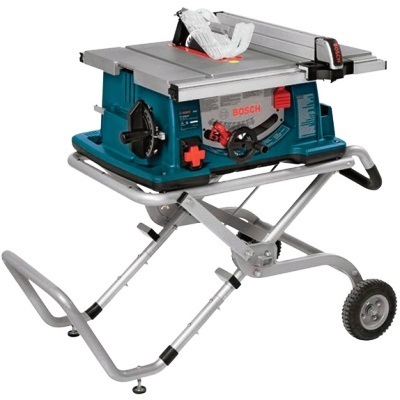 Bosch table saw provides 8 inches treaded pneumatic wheels that allow the users to take it from one jobsite to another without any difficulty. It comes equipped with a Square lock rip fence that is designed to provide the extreme precision in cutting the wood pieces. Moreover, there is also the provision of riving knife and anti kick back pawls that add to the security of the users, especially when the kickback occurs while cutting the wood pieces. It arrives with the provision of 3650 no load RPM motor that is capable of dealing with the large pieces of wood with expertise and precision. It has got a large surface area along with the amazing rip capacity that can cut the wood pieces that are up to 25 inches wide. Thus, it is highly recommended for the serious woodworking projects that involve the use of large pieces of wood and require acute precision while making the cuts. The added benefit of Bosch table saw is that it arrives with the provision of one year warranty backed by a 30 day money guarantee. A result oriented machine packed with incredible features. High speed with 3650 no load RPM motor. Provision of key safety features. A big tabletop with the dimensions of 29 x 21-1/2-inches for handling large pieces of wood quite effectively. The cooling fan doesn’t come with filter and make its way to the motor. The miter gauge doesn’t work so effectively on the miter track and needs to be checked. The textured grey coating may hamper the easy slide of wood on the tabletop. Shop Fox table saw arrives with the provision of 2 HP single phase motor that can run on 120v to 240v with amazing precision. There is provision of 4-inch dust port that makes it a highly efficient table saw that offers the safety and clean environment for working efficiently. It has got the ripping capacity of 30 inches to the right side and 15 inches to the left side of the wood. There is provision of easy glide fence system for optimal performance. It arrives with the provision of T-Slot miter gauge for enhanced accuracy. Shop Fox table saw is highly recommended by me as I got the opportunity to use the table saw in one of my professional woodworking project. I must say that I am impressed by the fact that is a great amalgamation of contractor table saw and cabinet saw. It has got the advanced features of cabinet table saw accompanied with portability and huge size of contractor saw that makes it a highly recommended product for all the serious woodworking enthusiasts. There is provision of blade saw that can be changed easily along with anti kickback pawls that make it safer to use for the heavy woodworking projects with ease and precision. It has got the trunnions that are ideally mounted on the cabinet to provide high end results. The provision of 4 inch dust collection port makes the table saw a great product for all the woodworkers as they can enjoy the uninterrupted hours of woodworking with safety provisions. The blades of the table saw have been designed to tilt anywhere from 0 to 45 degrees that make them amazing for cutting bevels, chamfers and compound miters. The blade guard assembly of the table saw is designed in such a manner that the user can watch the material being cut by the blade that is being surrounded by the barrier to avoid any injury to the user. It is sturdy, portable, and durable. Designed to cater to the heavy woodworking requirements. The sliding guide needs to be adjusted frequently for having better results. The fence doesn’t seem to be square and cause trouble while working. The side wings are designed with poor quality steel. 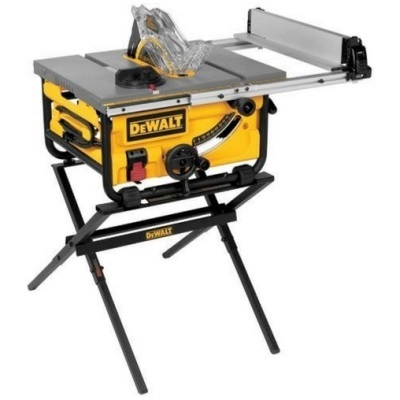 Dewalt table saw arrives with the provision of 15 amp motor and 24 inch of rip capacity. It offers the Site pro Modular Guarding System that is meant offer the precise adjustment of guarding components. The provision of adjustable rear feet helps to move the table saw quite effectively on the rough surfaces as well. The machine weighs 48 lbs that make it highly efficient and mobile to be taken from one jobsite to another with ease. The high quality table coating offers the smooth operations without any frictions. After using Dewalt table saw and I must recommend it to all the serious woodworkers as well as the budding enthusiasts. It is a premium quality machine that arrives with the Site Pro Modular Guarding System that allows the tool free adjustments of its guarding components. Moreover, the users can go for adjusting the guarding components for each different application with precision. The other factor that makes it highly efficient is the provision of a well built table saw stand that offers effective storage as it can be easily folded flat for convenience. The provision of 15 amp motor makes it a heavy duty machine that is considered ideal for tough woodworking tasks. The provision of rack and pinion telescoping fence rails provides an effective way to adjust the fence quite smoothly and in a quick way. Moreover, the blade can be effectively adjusted from 0 to 45 degrees for making all the bevel adjustments with ease. There is use of 24T carbide blade that is meant to enhance the quality of cuts and also improve the shelf life of the blade. Along with this, there is a provision of 2 ½ inch port of vacuum that helps to maintain the work area clean and safe from dust allergies. It is a perfectly designed machine meant for high end results. It is accompanied with all premium features and safety guidelines. It can work efficiently on the uneven surface owing to its provision of rear feet that are adjustable and enable to even the table saw on rough surfaces. Owing to its minimal weight, it can easily be moved from one place of work to another. The in-feed length of 4.5 inches is quite short in this table saw. It doesn’t provide the T-slot for operating the miter gauge as the provision of flat track makes things bit risky with the possibility of kickback. The system of the blade lock doesn’t work as effectively it should work. 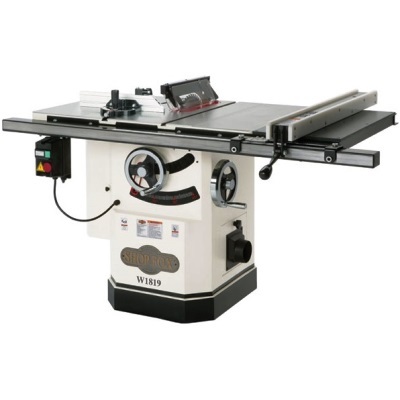 The Woodtek table saw offers the amazing results as it comes equipped with 30 inch rip capacity. It is built in tripod caster system that makes it easy for the users to make a place for it in their garage or the work site. It comes equipped with 2hp horsepower and have the voltage capacity of 115/230 v.
There is a provision of a T-Square fence system that makes it safer to use. The provision of a dust collection cabinet makes it a preferred machine for smooth working. I got the opportunity to work with the Woodtek table saw in one of my recent projects and I found the machine quite smart, efficient and well built. The best part of the machine is the design of the tripod caster system that makes it extremely easy to fix at my shop. The use of cast iron on the table top, accompanied with solid wings makes it a sturdy and efficient table saw. The provision of dust collection system makes it an efficient machine that allows for the continuous hours of uninterrupted working with a clean environment. There is also the availability of riving knife along with splitters to make sure that the users don’t have any chance of getting hurt while working on the machine. There is also the provision of rail mounted switch that offers ease of access and usage by the woodworker. It has 2hp motor with 1PH with 115/230 V, voltage capacity to provide optimal performance. The other key aspect of this Woodtek table saw is that it has got the maximum ripping capacity up to 30 inches that make it a perfect machine for working on huge materials with precision. Thus, it is a high quality machine that offers accurate results. It is a high quality machine that offers excellent rip capacity. It offers well built design and incorporation of advanced features. The table saw is extremely efficient while working on the large piece of wood. Assembling the table is not easy and may require assistance. The quality of miter gauge doesn’t support the powerful table saw. There is need to use a support for extension legs if you are working on a large piece of wood. Shop Fox table saw arrives with a 3 hp, horse power, 220v and magnetic switch that provide complete control along with protection from thermal overload. It offers the maximum rip capacity of 29 ½ inches. There is a provision of 4 inch dust port for effective dust collection system. It arrives with the provision of a camlock fence with HDPE face that makes it effective to handle the wood piece. The riving knife helps to save the user from kickback by preventing wood piece from pinching the blade’s back side. Shop Fox table saw is known for its superior quality built and high end performance. The 3 hp motor accompanied with cast iron trunnions and wings add to its durability and long shelf life. What makes it more interesting is the provision of easy glide T-fence system along with knurled knobs that help in adjusting the fence quite effectively. Moreover, the availability of nylon runner on the inner side of the fence head helps in its effective utilization. It has got the polished iron cast table that along with wings to offer the best workstation for creating the flawless projects. There is provision of standardized dado table inserts along with quick release blade guards that come equipped with retractable pawls and independent lifting sides for optimal performance. The availability of a riving knife that easily follows the tilt movement along with up and down movement of the blade assures best results. The provision of polycarbonate guard helps the user to have the clear view of the cutting of the blade that enhances efficacy and control of the user over the wood piece. The availability of a miter fence makes it easy to work on the longer piece of wood as it provides better support and control over the wood piece as compared to miter gauge. It is ideally recommended for the bigger projects. This shop fox hybride table saw offers the provision of extensive use of power accompanied with premium features and safety provisions. It offers safeguard against injuries caused by kickback. It is tricky to lift up the blade of the table saw. The hybrid table saw is an amalgamation of the cabinet table saw and contractor table saw. It offers the benefits of both the table saws in an efficient and power packed performance that can be utilized for professional purposes and it is equally suitable for all those hobbyists who prefer to have their DIY projects with professional expertise. The cabinet saws offer the superior results with professional expertise, but their down point is their huge size along with being highly expensive. While the contractor table saw are smaller in size, but don’t have much power for high end woodworking projects and need huge maintenance cost. But the hybrid table saws are smaller in size, portable, highly recommended for power packed woodworking projects. 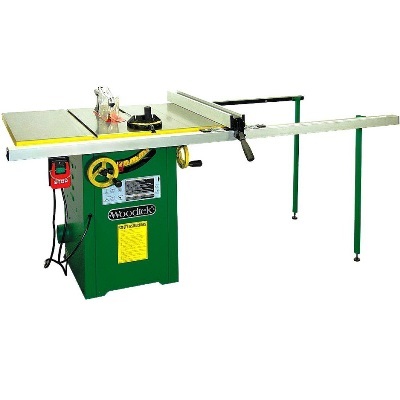 Moreover, these table saws are inexpensive and require less maintenance. Thus, the hybrid table saws are highly recommended for bigger projects as these machines offer professional expertise to the serious woodworkers as well as for the beginners. The first and foremost criteria of hybrid table saw is that it should be easy to set up and all the instructions must be clear to the users as well. If the installation of the table saw is complicated, then you must take the help from a professional expert, otherwise you may end up getting injured while trying to fix it up, Moreover, it is recommended to read all the instructions carefully as it would help you to understand all the key aspects of the installation of the table saw. You must understand the key aspects of the hybrid table saw that should make sense to you and if you are not able to comprehend the different aspects of installation, then it is better to hire a help. Portability is another key aspect that a hybrid table saw must have as the user can be able to take it to his jobsite. It is recommended to all the woodworkers as well as the DIY enthusiasts, to keep a check on the portability factor of the hybrid table saw. The key reason is that the main aim of every woodworker is to buy a table saw that is highly portable and allow the complete freedom to the users to use it anywhere. Thus, if you are going to buy a hybrid table saw, then look at its credentials especially the portability factor. The sawdust is considered as one of the key concerns of the woodworkers. It is observed that the woodworkers often face a lot of issues, especially when they are using a table saw with no control and provision of sawdust collection. As the work station looks messy and the sawdust can cause allergies, so it is always recommended to choose the hybrid table saw that is accompanied with an effective mechanism of sawdust control. It will not only provide control over the sawdust, but also offer a clean working environment that would increase working efficiency of the users. It is viewed that the table saws prove to the major source of injuries and amputations in the USA. As in every ten minutes, there is an injury to the woodworker or there is a case of amputation. Thus, it is highly recommended to consider buying only that table saw which comes equipped with all the necessary safety features. It is in fact mandatory for all the woodworkers to follow the guidelines while working on the hybrid table saw as even a minute deviation from the instructions can prove dangerous for their life. So, the woodworkers must consider the safety features of the table saw on the priority basis to ensure their safety. 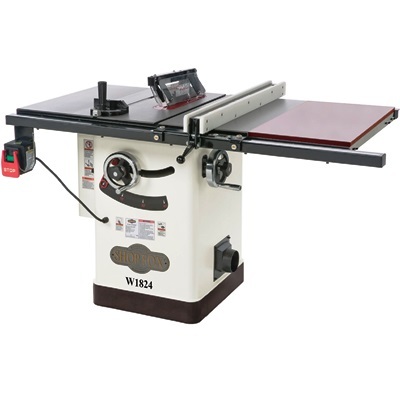 The table saw is meant to provide numerous opportunities to the woodworkers to create great woodworking projects. So, they always look for a hybrid table saw that offers the additional benefit of having the extension table. In fact, the extension table provides the benefit of creating great wood work by using the larger wood pieces on the extension table. Thus, you must consider buying the hybrid table that comes equipped with the provision of the extension table compatibility. So, give a new dimension to your creativity by buying a hybrid table that has extension table compatibility for optimal results. Rip fence is crucial aspect of every hybrid table saw as it is correlated to the safety of the users. So, while buying the hybrid table saw, the important thing that you need to consider is the rip fence. In fact, a rip fence is considered as the most relevant aspect of the table saw as it is designed in the form of the bar. This bar shaped rip fence acts as a guide to all the wood pieces as they move along the blade. So, a sturdy rip fence is required in a well built table saw to ensure that the safety of the user. The table saw that offers quality and high end precision calls for some hefty investment on the part of the woodworker. As it is a heavy duty machine, so the woodworker would like to buy the machine that is powerful enough to make the successful woodworking projects. So, it is relevant to buy the hybrid table saw that supports the strong machine power with well built machinery that must have a longer shelf life. Thus, if a woodworker requires creating the highest quality woodworking projects, then he should invest his money on the hybrid table saw that is powerful enough to support bigger projects and offer durability factor also. The hybrid table saw must be equipped with the features of being lightweight and at the same time offer the benefit of easy storage capability. It must be understood that buying a hybrid table saw is a great step on behalf of the woodworker who needs to give practical dimensions to his creativity through his woodworking projects. Thus, it would be highly relevant for all the woodworking professionals to make a decision in favor of the hybrid table saw that is lightweight as they can take it from one jobsite to another. Along with this, the added storage capability helps to keep the working table free from clutter effectively. The woodworker or a novice should first of all read the safety instructions and get the clarity about the adequate assembly and usage of the product. He should understand the usage of the different components of the table saw like table, fence, blades, blade insertion, and adjustment of the blade angle and height and power button. He should understand about the three types of cut that he can make while using the hybrid table saw. These cuts incorporate the cross cut, rip cut and dado cut. The height of the fence should be adjusted either slightly above the top of the material that is being cut or adjusted completely at the top of material depending on the work and material used. He should change the inserts and blades according to the type of work he would prefer to do with the table saw and the wood piece to be used. Making the required cuts with a keen eye for detailing and precision is necessary to avoid any sort of injury. The hybrid table saw is highly recommended and revered by the professional woodworkers and carpenters. As the hybrid table saw offers the premium quality build, higher rip capacity with higher performance level. It also offers low maintenance, effective dust collection system and competitive pricing structure. It is viewed as a powerful machine by the experts in the field. On a whole, it can be stated that the hybrid table saw review offer a comprehensive insight into the divergent aspects of the best hybrid table saw. Thus, if you intend to buy a hybrid table saw for either fulfilling professional commitment or for doing a DIY project, then make sure to go through the information presented above that provide an honest opinion and review about the hybrid table saw. The hybrid table saw offer the cost effective, powerful performance that is backed by its top line of features. So, if you need to use the professional expertise of a power packed machine that offers the benefit of low maintenance and long shelf life, then go with the hybrid table saw. Therefore, I hope that review proves to be of an adequate help to you to guide you in making a smart decision for your woodworking projects.